That is a promise! We press Comics as a service now! Amazing Inventory of Gold, Silver and Bronze Comics and Original Art. Feel free to call us M-F, 9-6 EST at 508-829-2259 or 508-UBWACKY. Joe, Ted, Jose, and Lisa. including a hugehalf-price section! Our grading is strict and professional. 1st Ant-Man x-over, wasp, Doctor Doom. Thing vs. Hulk conclusion. Fantastic Four #26 published by Marvel in 1964 and CGC universal grade 4.0. CGC graded 4.0 with off-white pages. Published in May, 1964 by Marvel. The average used comic book. Cover reflectivity is low. Can have moderate creases or dimples. Corners may be blunted. As much as a 1/4" triangle can be missing out of the corner or edge; a missing 1/8" square is also acceptable. 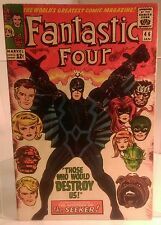 Great cover highlights this classic, early, must have, tougher to find, 10th issue of FANTASTIC FOUR from 1963 and MARVEL comics.art/action by STAN LEE, JACK KIRBY. THING, HUMAN TORCH, MR FANTASTIC, INVISIBLE WOMAN and the 3RD DOCTOR DOOM.nuff said! Stan Lee and Jack Kirby! The Fantastic Four! Fantastic Four 19. The 1st Rama-Tut! (later known as Kang The Conqueror!). Do not miss your chance to own this Silver Age Classic at an affordable price! Early Daredevil cross-over appearance. Dr. Doom cover and appear. Stan Lee story and Jack Kirby artwork make for another early Marvel Age classic. #39 has Wally Wood inks. Fantastic Four #39 and #40 as a lot of 2 (Marvel)(1965) in very good 4.0 condition. Cover pencils by Jack Kirby, inks by Paul Reinman. First appearance of Pharaoh Rama-Tut in "Prisoners of the Pharoah! Letter to the editor from comics writer Steve Gerber. The events of this very issue can be seen from different points of view in the pages of Doctor Strange (1974 2nd Series) #53 and Avengers West Coast (1985) #22. Published 1968 by Marvel. Grade: VG 4.0. 1st appearance of Franklin Richards and 1st appearance of Annihilus - "Let There Be Life!". Script by Stan Lee, pencils by Jack Kirby, inks by Joe Sinnott. Kirby/Sinnott cover. Fantastic Four 67 CGC 4.0 - OW-W Pages - 1st Adam Warlock / HIM -. 1st Adam Warlock. Your item will be double boxed with the bubbly stuff. Up for purchase is a Fantastic Four #18 comic book. This book has been professionally graded by the CGC with a grade of 4.0 cream to off-white pages. Also signed by the creator himself, Stan Lee, on 7/16/18 shortly before he passed away. This comic includes the first appearance and origin of the Super-Skrull along with a full page ad for Avengers #1. Don’t miss out on your chance to add this amazing comic to your collection! Comes from pet and smoke free home. I’ll gladly ship internationally and if the cost of shipping is cheaper than quoted I’ll gladly reimburse the difference to the buyer once item has shipped. Multiple art pages can easily be combined because they are light and thin. For instance, two statues require a much bigger box. How do you grade?. I have been collecting for over 30 years. A STAT is essentially a photocopy glued on to one or more of the panels by the artist done during production of the piece and is not original artwork. CGC 4.0 FANTASTIC FOUR #26 .. THING VS HULK .. CLASSIC COVER .. AVENGERS APP ..
ALL CGC CASES ARE IN PERFECT CONDITION UNLESS OTHERWISE NOTED. A GREAT COPY OF FANTASTIC FOUR #26 CGC CERTIFIED 4.0 WITH CREAM TO OFF PAGES. GOOD LUCK AND NO RESERVE. 1964 Marvel Strange Tales #116. CGC graded 4.0 Very Good. Cream to off-White pages. Human Torch battles the Thing. Great early Marvel book! Part one of Warlock (Him) origin. With his sense of self-worth renewed, Ben heads back to the Baxter Building. But the two manage to patch things up when Johnny starts to fool around. They explain to her that they have been working for years to try and create an artificial lifeform. Of The Inhumans. Fantastic Four #45 (Dec. 1965). Cover pencils by Jack Kirby, inks by Joe Sinnott., script by Stan Lee, pencils by Jack Kirby, inks by Joe Sinnott; The Fantastic Four try to slow Galactus while the Watcher takes the Human Torch to find a weapon to defeat Galactus; Alicia Masters convinces Silver Surfer to help humanity. A very presentable copy of this key issue with a tape pull dragging the grade down a bit. Fantastic Four #77, 1st Series, Galactus & Silver Surfer Appearances, Jack Kirby (Marvel Comics, August 1968). Grade: VG 4.0. Comic is estimated to be in the 4.0 VG range with wear typical of estimated grade. Published 1964 by Marvel. Grade: VG 4.0. This is a low grade item. It will be complete and readable, but will show significant wear. of comics, generally about 25-40 comics depending on page count. The Hate Monger! Stan Lee and Jack Kirby! Nick Fury! The Fantastic Four! Fantastic Four 21. 1st Silver Surfer and Galactus cover. 1st full appearance of Galactus. 2nd Appearance of the Silver Surfer. Fantastic Four #49 published my Marvel Comics in April, 1966. Fantastic Four. Story: I recently took in about 100,000 comics with about half being silver age and bronze age Marvel/DC in various grades. International Varies. Canada Varies. Published 1966 by Marvel. Grade: VG 4.0. Cover pencils by Jack Kirby, inks by Joe Sinnott. Second appearance of the Inhumans (first Black Bolt cover and full appearance) in Those Who Would Destroy Us! His heroes were people who keep moving forward and never give up the fight or as Stan would say: "Excelsior!". Notes Signed by Legendary STAN LEE! Signed By SIGNED BY STAN LEE ON 5/26/17. In other words he is a genius. FANTASTIC FOUR ANNUAL #2 (4.0) ORIGIN OF DR. DOOM KEY! I see the word STAT when describing the art page I’m interested in. What’s a STAT?. Multiple art pages can easily be combined because they are light and thin. For instance, two statues require a much bigger box. Fantastic Four #45 in VG/VG 4.0/4.5 Condition featuring the FIRST APPEARANCE of The INHUMANS! From Marvel, 1965! Yes these are THOSE INHUMANS which will be a Marvel Movie in 2019! Good Luck! If you have been looking for a place to build your comic collection where you will get. Of The Skrulls. Fantastic Four #37 FN 4.0. Fantastic Four #45 1965 1st Inhumans Lockjaw CGC 4.0 Signed Stan Lee! Featuring the 1st appearance of Lockjaw and the Inhumans including Blackbolt, Crystal, Karnak and Triton! Books is also signed by the legendary Stan Lee!